you would like to share please contact the website. Click here for contact info. - I had the great pleasure of working with Peter in 1980. We were supposed to sing together in the Song for Europe,.alas it never happend. I think Peter was poorly, in the end I sang with a guy called Eddie Howl. Just wanted to say Pete was lovely and as a very scared twenty year old, gave me tons of help. I found an old address book recently, and inside was Peter,s address and phone number. The address reads The Kestral Hampton Wick. I was fortunate to meet Peter in 1977 at the reading rock festival. I was a guest of Bronze records, there to write a review on a band called Uriah Heep, and Simon Porter,[now manager for status Quo] introduced me to him. He was feeling a bit down,as he was thinking of auditioning as front singer for the Little River band but was unsure as he wanted to make a solo album himselfe, and he'd been wondering back stage looking for someone to talk to, I was lucky enough to have a lift laid on to take me home, and back to the festival the next day, thus escaping the horrors of camping in the mud,I had invited Simon back with me and we were all about to leave as it was very late and very drisly when he pleaded for us not to go, as he said he had no where to stay and wanted to talk to Simon , so I invited him back to my house which was a scruffy flat near the Oval cricket ground. He slept in my daughters bed in her room amoungst all her toys and teddys,[she was at my mums at the time] we stayed up most of the night chatting playing records and in the morning I cooked a fry up, then the lift arrived and it was time to get back to the festival.I had tried to clean some of the mud off his shoes, which were trainers and he kept thanking me. Anyhow he must of enjoyed himself as he came back the next night as well ! !When we said goodbye he scribled his address and phone number on a bit of paper and gave it to me and asked me to keep in touch, but for various reasons I didn't [a big regret], He later on sent me a copy of his album SKIN DEEP, which I have to this day. It must have been the album that was decided on at my flat.I only heard he had died a few years back,and was shocked as he must have been quite young,I will always remember him. - I had the privilege of knowing Peter and Jane for a short while when they lived on his boat, Kestrel, moored in Hampton Wick, near Kingston, 1977 to '78. I had been frequenting the Old King's Head, (also known as Nobby's) when Peter and I struck up a conversation about cars one day. I remember I fixed Peter's Triumph Stag for him when the fuel pump broke (it was a black one with gold pin stripes in the John Player Special colours). I had just met my (although I didn't know it then) future wife, Jackie, we are still married some 29 years on. Peter had been working on Skin Deep and we would sometimes go back to the boat after the pub and talk for hours, sing stuff together and drink wine or coffee and smoke. I was just a kid really but Peter inspired me to enjoy more music and introduced me to David Jones and Mickey Dolenz (from the Monkees) (boy was Mickey into his tennis then!). I still have a copy of Skin Deep, (one Peter gave me) and could never understand why it didn't become a huge success. I think Peter had written a lot of his personal feelings into those tracks (I especially like the little dig at the record companies). I left Kingston when I got married in Sept '78 and when I returned after my time in the army Peter had moved on. I think eveyone who knew Peter even for a short time was touched by his great personality and enthusiasm for music. Rest in peace Peter. Thank you for your friendship. - May 6th 1973 the New Seekers performed at the Fairfield Halls, Croydon. Our tickets were for the first performance, third row, Peter's side of the stage - brill!!! My mum did us proud getting those tickets - spot on!!! 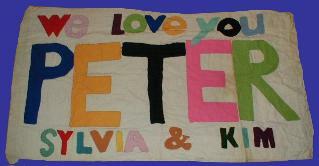 Kim and I had made a banner which we proudly waved at Peter - to the disgust of the people sitting behind us. The show ended. At the rear is a car park, which was locked, but all us fans were peering through the railings - and we had the banner. Peter came over to us, took our banner and ran around the car park, waving it - bliss!!! He gave the banner back - we didn't dare touch the poles that HE had touched - they were sacred! At this point we were supposed to go home - couldn't get in touch with our parents. we started talking to one of the door men - an elderly man, called James Gooch (we even got HIS autograph!!!). After a while, he said that not all the seats were taken for the second show, and let us in, to see the show again. We were right at the back this time, waving our banner, being careful not to touch the sacred part! During the song Day by Day, Peter saw us and gave us a thumbs up sign - 'He's seen us' we were screaming. What memories! By this time, it was getting very late, and our dads turned up looking for us - but after what we told them had happened, I don't think we got told off - much! I still have the banner, but it's filthy and I daren't wash it. My pole is in the shed with a plastic bag over where HE touched it. Kim had the other pole - if she still has it. A year after that event, we went back to the Fairfield Halls and found James Gooch to thank him. He bought us tea and cakes! - I played guitar regularly for Peter with the Virgil Bros in '68. He was a fine professional. Malcolm (McGee) was in the group. A regular drummer & I rehearsed then augmented whatever different backing band was playing that night. For the occasional local shows where there was no backing band, they (the Virgils) asked me to book a bassist & they'd just use a trio behind them that night. The regular drummer was Kevin Murphy who I later played with in Friends, the Aztecs & King Harvest & he was in Chain. I had a little trio at the time, so booked bassist, Greg Spencer for those nights. Sorry Peter's not with us. 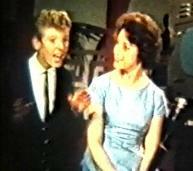 - We [Normie Rowe and the Playboys] were on tour in outback Queensland with Peter in the early sixties. It was summer, stinking hot even by our standards. We were travelling by bus and stopped to pick up a rather large, very dead python. Norm wanted it so he put it in his guitar case. Peter was not on our bus. Now on tour Peter was a pest. He was always first out of bed in the morning, and he would go along the corridors banging an every door looking for someone to lend him a guitar. He came to Norm's door and Norm, half asleep said yes come in and take it. A few moments later the most terrifying scream came from Peter's room. Peter was a little fragile at the best of times, but his reaction was really over the top. He blamed all of us, especially me, for setting him up. It was all quite innocent. Norm had genuinely forgotten about the snake, and for the rest of that tour there was nothing we could do or say to convince Pete that we didn't have it in for him. Right to the end, if any of us mentioned anything about snakes, he would always rise to the occasion with 'you buggers set me up'! - I first saw Peter Doyle on a show here in Melbourne called Swallows Juniors in black & white, late fifties I think, this was a talent type show with about 6 to 8 regular young children, ranging from I would say 6 years of age up to about about 15 I can't remember most of them, I only remember Peter because I had a big crush on him when I was a little girl.... On this show they would have equal girls to boys and they would be teamed up to not only sing the hits of day but dance as well and the dancing in those days consisted of modern and tap dancing, I can remember Peter dancing in top hat and tails. To me Peter really stood out, he was very very blond and as I remember wasn't the youngest and wouldn't have been the oldest of the boys, he was always smiling and even in those days he had a really good voice, this show did go on for some years but not many of the youngsters from that time went on to bigger things but Peter..... the 60's happened and the Melbourne Go Show!! was born in 1964 and Peter showed he had learnt a lot from his talent show days, singing solo on the Go Show!! and doing the rounds to the rock venues, then later joining up with The Virgil Brothers he proved to everyone that he was a super talent with an exceptional voice In those days it was only a few artists that made it in a big way overseas, Peter did this here and overseas with the Virgil brothers and then joining The New Seekers. The rest is international history. My memories of Peter range from a gorgeous little blond boy singing and dancing to a super star Aussie/International idol. The one thing I can say about Peter is that he never ever lost the respect of the Aussie fans and he always had the upmost respect from fans and peers, Peter is what we would call here in Aus.a good bloke - one hell of a talented good bloke.